reception, WLAN in reception area. comfortably furnished. in Scandinavian style. kitchenette. stove with oven, dishwasher, microwave, coffee machine, kettle, toaster. TV, stereo system. wood-burning fireplace, floor heating (fee payable). terrace, balcony. parking space. terraced house, across 2 floors. living / dining room. bedroom, 1 double bed.bedroom, 1 bed und 1 sleeping facility. bath tub or shower, toilet. 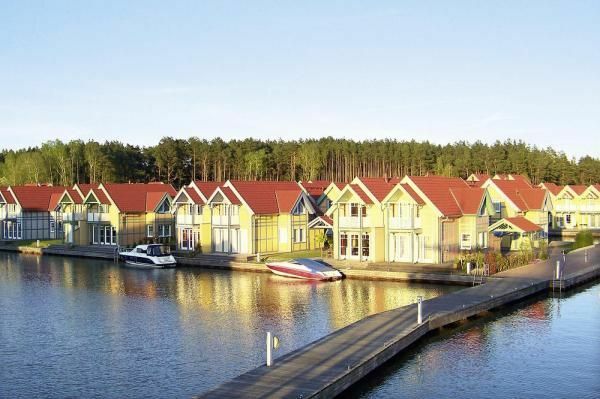 shopping 2 km, bakery 2.5 km, restaurant 2 km, bathing 100 m, lake Rheinsberger See 10 m, location Rheinsberg 2 km, location Berlin 90 km. Im Hafenbecken ist das Angeln nicht erlaubt. Die Babybetten sind geeignet für Kinder bis 2 Jahre. boat rental (fee payable), canoe rental (fee payable). freezer.